It’s not Alma the actress. It’s not Isko the politician. It’s not Tito Germs the TV host. Neither is it a moreno (brown olive) skinned human being. It is a Moreno-surnamed-athlete who made me so proud and so happy today. Luis Gabriel Moreno, an archery events athlete just won a gold medal in this year’s Youth Olympics presently being held in Nanjing China. With nothing to watch on TV today while I do my laundry, I settled watching TV5 network this afternoon. 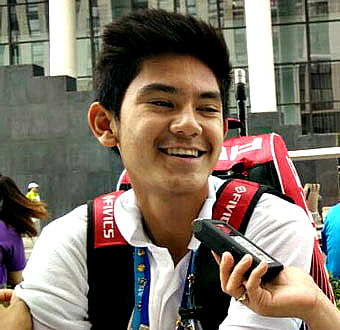 Not even aware that Youth Olympics is ongoing, I settled on watching a Mixed Archery event upon knowing that one of the athletes competing was a Filipino. The sports feature started during the quarterfinals match of Moreno with his Chinese partner, Li Jiaman. I was initially not expecting anything because before the game started a sports anchor announced and flashed on the screen the medal tally of the ongoing Youth Olympics. And to no surprise the Philippines – as usual – has yet to win a medal. 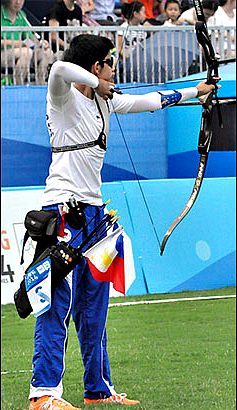 But interest and uneasiness about the mixed archery game fired up when Moreno and his partner won the game to qualify for the semi-finals. And when the tandem won their match to qualify for the grand finals and compete for the gold medal, I was already ecstatic. I was so nervous watching the event and I was clapping my hands every time Moreno and his Chinese teammate hits the 9s or the perfect 10s. I was screaming ‘Yes! Yes! Yes!’ And I was praying to the heavens to give this event to the Philippines and China. The general feeling was reminiscent of me watching the tennis matches of Roger Federer or me watching the boxing bouts of The Great Manny Pacquiao on TV. When Moreno swished his last arrow to clinch the gold medal beating the Malaysia-Germany tandem, I was shouting, clapping, jumping and earnestly praying saying thank you. The TV anchor then appeared looking very proud and equally ecstatic saying that this is the first medal for the Philippines in this year’s Youth Olympics. And that the young Moreno is a student of De La Salle, thus literally living up to the bill of being a true Green Archer. Well, today is the National Heroes Day and I am glad to be feeling proud. I guess Luis Gabriel Moreno achieved something great, worthy of being called a young hero of this country.